Welcome to the first narrated Thimbleweed Park video. Sit back end enjoy 4 minutes of my smooth sultry FM radio voice as I explain our latest tool: Wimpy. This is the first time I've ever done a narrated video (for anything), so I do apologize for it being a little choppy and scattered. I'll get better. I found it odd doing narration because I'm just talking to myself. I guess it's one of those things you get used to the more you do it. Next time I might try it was someone else in the room, listening to me. One of the challenges I face with doing narration is that I'm not naturally a talkative person. I like to sit and think about things, I can't just ramble on about stuff. And I'm OK with that in my personal life, it just makes doing fun stuff like videos and twitch streams difficult, unless you like watching a video where I sit around and think about stuff. OK, enough about me. Let's talk about Wimpy. Wimpy is a tool I've been working on for the past few days and it's purpose is to allow game programmers to visually define the objects that appear in a room. They can select an object, change it's hotspot rect, use position, as well as move the image around the screen. Up until last week, I was editing the room's .JSON files by hand, which is fine for a few test rooms, but we're starting to build the rough-cut and I need to be able to quickly get rooms defined and into the game. Our goal over the next few weeks is to have a completely walkable version of the world. This will allow us to walk around and see how the size and connectivity feels. Based on this, we might change how the map is connected, or add and remove rooms as needed. It's important to do this BEFORE you've spent the time creating final rooms. When I started the tool, I wasn't sure if I wanted to built it into the game's run-time, or as a standalone tool that used the same library as the engine, or as a native GUI app. Building tools into the actual game can be nice. It means when you're playing the game, you can flip it into an editor mode and change objects live. There benefits to doing tools like this, but I also feel that it can add a lot of baggage to the game's run-time and I often find that integrated editors are harder to maintain and aren't as slick as they can be when done stand-alone. I also like to keep the game's run-time code as clean as possible. There are fancy-pants ways around all this, but the end goal is to build a great adventure game, not build a toolset. The other issue with building tools into the run-time is saving data. When the room's .JSON files are loaded into the running game, they are instantly parsed and turned into internal game structures. If the data was editable, I'd have to reconstruct the files and then save them out. The internal data structures just aren't conducive to that. I also looked at building Wimpy as a truly native program, which would have given me access to all the list controls, buttons, menus, etc that your used to on the OS. This was problematic for a couple of reasons. The first is I wanted Wimpy to be cross platform. Gary, David and I all work on Macs, but we might bring someone on that works on Windows and I don't want to maintain two versions of all the tools. I could have used wxWidgets or Qt, but I don't know them very well and the look and feel of the UI always seems off. No matter what OS you're running them on, it's just slightly (or more than slightly) wrong. So, what I decided to do was build it as a separate program, but use all my engine code so it replicated the look of the game as much as possible. For the game programmer, it's important that they see things as close to how they will actually appear in the game. Wimpy reuses a lot of code for the room and object rendering, animation, and loading. It means if I change how objects are rendered or data is stored, Wimpy will get these changes as well. I know I promised to show some actual code during this weeks update, but I think I'll save that for another post. Just think of it as the first in the long line of broken Kickstarter promises. My library started out as objective-c and I converted it to C/C++ a little over a year ago. I really enjoyed objective-c's retain/release model of memory management, so I replicated it, as well as NSDictionary and NSArray (complete with verbose method names). The stl drives me crazy. I think it would be a great idea if you made your tools cross-platform–or even better–publish them! It would be awesome for amateurs to make their own adventure games (you can also sell commercial licenses so they can sell their work with your tools). Just a thought. No! Don't let Tim Schafer near this project! We want it to be good! Don't you think he's good? Thats not fair. Tim does no bad games. Crazy thought that if he does contribute in any way he will take over and render it bad. Not going to happen.. Since I made a Schafer joke on Ron's blog that was poorly thought out, I'll clear my conscience by saying "Tim is awesome!". I don't think he's ever really made a bad game (and he has made several truly great ones), but he's no longer making the classic games that this particular audience enjoys. I think that both Tim and Ron are talented game designers and has a great sense of humor and they would be worthy to join Monty Python. This is great, would love to see more narrated videos. Ron, what is the name of the font you use for the game's verb and so on? It's nice because it's proportionally spaced, which the original C64 font was not, and that makes reading so much easier. I won't be able to use it in the final game due to licensing issues, plus it doesn't have the full Latin character set. I might have to find someone to make a TT font for the project. Creating a TrueType font is technically really simple, but for all I know there are some legal questions to be clarified because a font can be protected by copyright/design/patent law in some countries. Maybe it would be the best to consult an experienced font designer in this case. We plan on hiring someone to create our C64 font and it will include all the Latin characters (I think that is the right term), including Swedish. It's not on our schedule for 9 months, so we have time. If we find a good proportionally space C64 font will all the needed characters, and the license allows us to use it, then we will. Part of me would rather create our own, then we can release it for free for everyone to use. As a linguist, I can offer some insight into writing systems: when talking about the writing system that is used by speakers of English, Spanish, Swedish, German, and most of Western Europe, "Latin" is interchangeable with "Roman". So whether you call them "Latin characters" or "Roman characters", you're right! Why not include this tool into the actual game engine. So when you playtest you can edit stuff right away and save changes. Wouldn't that be a very 2015 like thing to do? Or is there an advantage in this setup? I addressed this in the blog text. GGNullPtr. For those times when the value of null changes. I define this for portability reasons. It will probably never be an issue, but you never know. I really liked that you also use video like that. Thank for the interesting video! Small question: What does the grey horizontal line indicate? Slightly bigger question: Do you plan to have a series of small one-purpose tools oder do you want to integrate a loot of functionality in one universal editor? If you plan to do a bunch of tools: Where is the advantage over a monolithic approach for an editor? The grey line is to set the z sorting. I forgot to show that. I like to keep editors and tools simple, so I don't usually go for the monolithic approach. Ron, this great video made me think of a question for you on objects or items that were ultimately red herrings in previous adventure games. What are your thoughts on items such as the chainsaw in the kitchen or the unusable spiral staircase in the library in Maniac Mansion in the context of today's adventure games? And actually, on the spiral staircase front, was that an area you had originally planned to put another room and cut the content for time/space reasons, or did you have various "dead end" items/things in the game to kind of add to the world or puzzlement? Getting ready to make my first (tiny) adventure game soon, and this blog is really inspiring. So thanks for posting. I think it helps a lot to have the tools built into the engine. Coding editors is quite tedious - why do it when you can have the graphics and animations right there to fiddle with. Because I like the game engine code to be clean and not filled up with cruft. True, you can compile that out for a final build, but it clutters up the code. Also, yes, you can manipulated data, but sometimes manipulating "live" data can mess up the game state. Also, as I mentioned in the blog text, it means you have to save that data back out again. Once the data gets loaded into the game engine, it is no longer in a state where it can be saved back out. To do that would make the game engine even more complex. Game engines that have editors built in are a lot more complex, it's not something I have the time to undertake. Doing separate editors isn't that hard. What's the advantage of props over clipping planes/masks? Much simpler. Props are just images that get draw at the correct time to be on top of below another object, most commonly an actor. We used clipping planes in SCUMM, but mostly due to speed issues. With modern hardware and GPUs you can just draw everything in the right order. It greatly simplifies my code. Ron, with props is there any intention to prevent the character walking through, say, the rope there? If it is just z painting order, can the character end up doing unexpected things? Once walk boxes are working, character won't be able to walk through objects. Ron, when you asked what you could do to make the blog better, well you just did. Not a waffle in site. Anyway... on to the reason I'm here... Video with commentary, awesome. Love the updates. I agree - I sometimes start using my fingers to do the math. It's oddly difficult. He's talking about the puzzle in Monkey Island 2. Ahh.. subtle reference. Yes, that one was tricky, I had forgotten about it. Can you parent those bounding boxes on the objects so, that when you move the clock for an exmaple that would move the bounding box as well. It's always a little hassle to move things seperately. But all in all, Wimby does look like a pretty elegant little object editor. It's simple, but does whats needed. I like that idea, Tomimt. Kind of a "group items together" command. It could not only lock the bounding box, but also the use-position so all the relevant elements could be moved together. I agree with you two. It reminds me of the group function in CorelDRAW. Ron, what JSON reader do you use? I myself am a game developer and have been developing my own game engine (using SDL, C++, and OpenGL) and have been looking for a simple one. I wound up writing my own parser for JSON as well, but I wish I had extended it to relax the syntax some. The commas and quotes are kind of a pain. Also, will WIMPY be available for download, or will we have to do what we did with SCUMM (https://github.com/AlbanBedel/scummc)? Just a quick comment regarding the embed of the video: When I played the video there was no sound, and no visible volume ctrl. I found the source URL for the video through right-click "view source" in Chrome and was able to view it with sound through there, and then later found out I had previously lowered the volume in completely separate Vimeo embed to zero and that had apparently translated over. Just a thought for those who might have had the same problem. How do you handle overlapping boxes? Like when you have a wardrobe that can be opened to reveal some shirt inside, and the shirt's box is completely inside the wardrobe's box. Are they ordered with the sprite's z-ordering? There is an attribute called dependancy. The shirt would be dependent on the wardrobe being OPEN. I have the engine code written for this, but it's not exposed to the scripters/wimpy yet. Ron, I see there's a cross mark on the use-position marker. I'm guessing that shows the facing position the character takes when he/she is in the use-position. How is that adjusted? And did we have something in SCUMM where the facing position on door objects was opposite when you were coming or going through a door? It's hard to see in the video, but the cross has a small allow showing the face direction of each object. But why do you say at 3:09 that it's pointing to the right, when it seems to point to the left (in my understanding)? What size are you? I need new pants. Thank you so much for this update! It's really awesome that you have been doing an amazing job with this blog from the gecko and then you still asked what you could do better. And right afterwards, you start implementing those suggestions. I know I'm repeating myself, but this has truly been my greatest backer experience so far! "...you have been doing an amazing job with this blog from the gecko..."
Wimpy is just sooo neat! Thank you for the demonstration! that I call Thimbly. I hope you don't laugh too hard when you see it. Hahahah , your voice is so funny on this video! I know it may not have been intended that way, but I find this comment quite rude. Escpecially if you take into consideration that Ron said he was not all that comfortable doing those videos. I think Ron's voice sounds perfectly normal. I agree with Soong. It's a completely normal and likeable narration. Especially it delivers a very interesting insight! If Wimpy is based on your engine code of today, is there a possibility that the codebases for the engine and Wimpy start diverging from eachother as the project goes along? I imagine some scenarios where something might bahave differently in the engine vs. the tool. Or do you just recompile Wimpy again if stuff changes in the engine? Yes, Wimpy uses all of the rendering code of the engine and it shares all the object loading and render code. If I change something, I will have to recompile a new version of Wimpy. For me at least, this is a much better solution than adding editor code the the game's run-time. It really makes things complex and error/bug prone. Thanks for the reply! It makes sense to keep Wimpy a separate entity. First of all, awesome post! This is by far the best dev blog I've ever read. Just a curiousity - how are the Paypal contributions going compared to the main crowd funding? Do they add a noticeable amount or is more like a 98/2% ratio? I always wondered since I backed few other projects on Kickstarter, but little to no word was given to the post-funded campaign. The paypal contributions were discussed in one of the first posts. IIRC, it's more like a 99/1% secenario. Yeah! I'm with the 1%! I have watched many streams of introverted people SLOWLY doing stuff without speaking. It wasn't a problem for the audience, they loved it. They are not there to see something amazing, they're probably working on their other monitor while they're watching. I think you're being too self-conscious here, and also, that you want the stream to be more meaningful than it needs to be (both are understandable for an extreme introvert). Ron, I took the liberty of contacting the people behind the C64 font and I got a very nice reply. :-) He/she/they wrote they have been experimenting with adding Latin characters, but wasn't sure how to do it properly within the tight space of 8x8. They said they haven't denied any requests to use the font in projects. 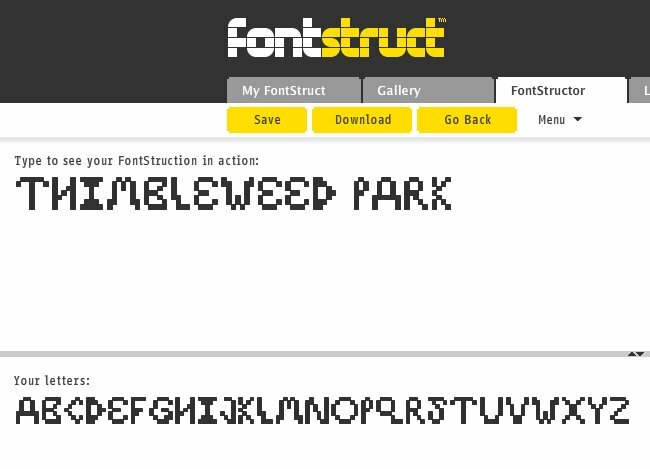 I suggest you contact them so you can get their permission to use the C64 font in Thimbleweed Park and maybe Gary von Graphics can help them add Latin characters. I apologize if I overstepped my boundaries now, but I just want to help out! Tell me more about how people stopped using boats when the airplane was invented and then tell me what you have been doing lately to try and help people for free! Thems sounds like fightin' words. This question may be a little bit too early, but I see that you invest a lot of time and work to create a super duper graphic adventure engine. So wouldn't it be a waste just to use it for only one game? Another great blog update, very interesting! Zak McKracken was just released on Gog.com for Windows Mac and Linux.for $6. Sorry for being off topic, but this was just too cool not to post. Buying it doesn't help its creators in any way. Plus, it has "improved" graphics that don't fit its old style. Not that the old graphics are better, but at least they are consistent. It includes the FM Towns version which is 256-color vs the original 16-color implementation. It also has the V2 DOS implementation included, which is 16-color, I believe, and much closer to the original. I understand the money won't go to the original developers, but it means that the game will be accessible now by a wider audience than before, and so in that way, it's a plus for adventure gaming in general, and could be a help to this game by way of an indirect advertising. Personally, I've been trying to look for a deal on the game on eBay for a long time, and have never played it. (which I'm ashamed to admit on this blog) Now I can (and plan to, this weekend). Now that I've played the two ScummVM versions of Zak in the Gog release for a while, I can tell you I MUCH prefer the DOS V2 version (16-color VGA Graphics) to the FM Towns Version (256-Color). I started with the FM Towns version, but a couple of things bugged me. One was that the 256-color graphics, and the way they used those colors, actually made some of the more visually oriented puzzles harder (I didn't notice the wallpaper, or the couch cushion in the first couple of rooms - in the 16-color version, these were more obvious, as I expected the developers intended them to be). Also, the FM Towns version included some gag references to the Indy games, where the DOS version included, in one case, a reference to Rescue on Fractalus in the same spot instead - which I thought was a much cooler reference. This makes me wonder what is different in the original 16-color CGA C64 version.. Also, I much prefer the more simplistic sounds of the DOS V2 version, it definitely feels more like playing games as a kid. In any case, this is getting me excited for Thimbleweed Park. When I get through Zak, then I need to play through Maniac Mansion all the way... I have that one through the minigame in the Day of the Tentacle got from an Ebay a while back. I start to wondering, did the game sources or the engine itself will be released with the game ? Just take a look at the FAQ. Of course it would be great. But I would be even more happy, if TP doesn't remain Ron's only game based on Grumpy. Naturally I have liked MM (and DOTT), but a lot of people hope for a spiritual successor to MI 1 & 2 - and who would be more competent for realizing it than Ron! But at this stage I'm simply pleased with the development of TP! It doesn't for two reasons. 1) Many objects on the screen that need to be tagged don't have separate images, they are drawn into the background, so there is nothing to automatically size to. 2) The work flow is to create the new object, which creates the hotspot box, then assign it an image. I could create a function that snapped the hotspot to the image (if it existed), but I haven't found the need to do that (yet). Your narration was really good. You really don't have to worry about it. Usually, people who are a "thinker" type tend to be more precise and concise when narrating. Not many people like videos full of rambling - so maybe you underestimated your suitability/qualification. :-) Keep up the good video/narration work!